Wild Primroses in the garden. There are many jobs for the kitchen garden over April (such as digging potato trenches, raking the soil, planting seeds, potting up and spreading compost) but something pleasant to start with might be a little armchair enjoyment in a primrose plant that grows by itself. Fortunately, for a kitchen garden, the leaves and flowers of this native wildflower, primula vulgaris, are edible which makes it a perfect addition to the vegetable patch as it can be used in the kitchen - as decorative flowers and leaves that can be enjoyed along with the salads! This popular woodland flower can be introduced to the garden if there are none already growing there. It might even form the start of an interest in native flowers; observing and recording plants and flowers growing in the garden. It was this yellow wildflower that captivated the curiosity and wonder of the famous local naturalist based in Kent, Charles Darwin. It has featured in poems and art for centuries; from watercolour paintings by master artists from the past to more recent wildflower paintings, such as a watercolour and ink illustration of wild flowers (including primroses and a honey bee) that I painted last year. Another botanical drawing last year was this more realistic coloured pencil drawing of primroses, with honey bee added this year, since bees as so fond of primroses and it would be such a shame to leave them out of a painting! These native wild flowers, often called common primrose or English primrose, are found in many countries around the world. Yellow brimstone butterflies arrive back in the garden at around the same time of year, when the sun starts shining, and a garden with splashes of yellow from the daffodils, tulips, forsythia, white blossoms and various other white to yellow blooms - along with the primroses - can evoke all sorts of imaginings that can be found in fairy tales and art. In sunny lane and wood. The honey bees love these pretty spring flowers, too! Winter-hardy perennial primroses can be grown for a garden filled with pretty yellow flowers that will naturally return each year between February and May, depending on the weather. 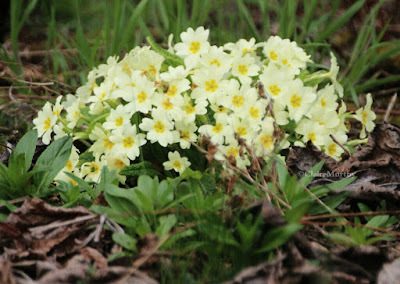 A splash of wild primroses amongst damp, moss-covered rocks and gnarled tree roots, or holding together some decomposing logs, bear the early signs of spring and, even on a grey day, a cheerful greeting can be enjoyed from an otherwise fairly dull, dark patch of turf in the garden! And if it's really too dull to go out side, then it's a perfect specimen for a wild flower painting or some nature-writing. Garden blog about setting up a new vegetable garden within a natural wildlife garden, in Kent.